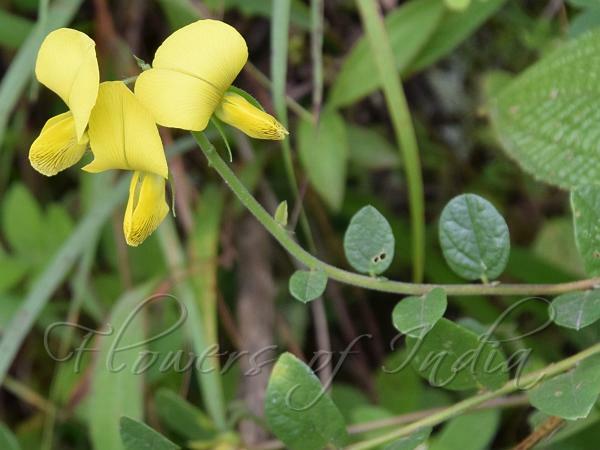 Many-Flowered Rattlepod is an erect tall herb with yellow pea-like flowers. Flowers are borne in 2-6 flowered racemes at branch ends. Bracts are linear, flowers yellowish, equalling the calyx, standard nearly round, with purplish veins. Stipules are linear or subulate. Leaves are simple, ovate, 3-5 x 1.5-2.5 cm, base rounded, tip pointed, often punctate. Pod is elliptic-cylindric with spreading silky hairs. Seeds 10-12. 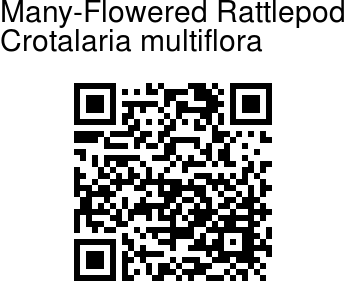 Many-Flowered Rattlepod is native to Peninsular India and Sri Lanka.